A Guest Post by Steve Martile from Freedom Education. Itâ€™s normal to have a bad day, right? Well sure. But what if you have a bad week or a bad month? Iâ€™ve been blogging for just over a year. And if there is one thing that Iâ€™ve learned is that youâ€™ve got to be consistent. Youâ€™ve got to be consistently putting in an effort to build your blog. It wonâ€™t build itself. So what about those bad days? Iâ€™ve had them and theyâ€™re no good. You want to bounce back quickly. Get out of that rut. The quicker the better. So you can get back to blogging, life and other things. When youâ€™re writing and you get stuck, do this. Get up, walk around and sit in a different spot. See your screen from a different point of view. Sit in a different location and gain a new perspective. You see one thing thatâ€™s true for anyone is that a change in your mindset will change your physiology – your body posture, facial expressions, etc. When you think new thoughts, the chemicals in your brain change. But what many people donâ€™t know is that the opposite is also true. A change in your physiology will also change the chemistry in your mind. This the same reason why some writers will use exercise as a way to gain new insights and spark their creativity. A change in there physical state creates a change in their internal state. Body movement is an effective brain stimulator. So get your body moving. Get up and go for a walk, get some exercise or just change locations to trigger that inner change – the place where you get all of those great ideas. I think over the past 3 months, 70% of the blog carnivals I submit to have either quit or stopped publishing. Which tells me one thing, that more than 7 out of 10 people will quit blogging within 3 months of starting. Donâ€™t let that be you. Keep your momentum going by using this mind power technique #2: track your progress. Recently, I spoke to a sales representative from iperceptions – a survey company that provides statistics and data for websites. What they do is survey people who navigate your website or blog. As part of their surveying process they tested different methods and found something really interesting. What they did was add a status bar at the bottom of each survey page. That way users could see their progress as they went through the survey. When they did this, the survey completion rates increased by an astounding 67%! Basically, this is what happened. When users new how well they were doing, they kept going. But if they didnâ€™t have any signs of progress, they quit the survey altogether. How can you use this technique with your blog? 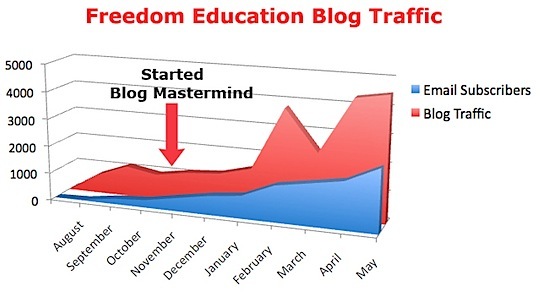 Start tracking the traffic of your blog by creating a blog traffic diary. I learned this technique from Yaro Starak @ Entrepreneurs-Journey.com. A blog diary is basically a way to track the unique visitors and pageviews for your blog. I thought it would be a good idea to track my Newsletter subscribers as well. Hereâ€™s a snap shot of my traffic and newsletter subscribers each month from November 08 to May 09. What I found from following this process is that I instinctively became more proactive. I started to think ahead about how I could improve my traffic. If I saw that my unique visitors were down one month, then I would brainstorm ways to improve my performance: either by creating better content or putting more effort into my marketing. Iâ€™ve been pretty active with my blog diary. I still keep it up to date because itâ€™s such a great tool. Iâ€™ve pretty much shared what has worked for me and what has not worked over the past year. You can see my blog traffic diary here. ProBlogger, StevePavlina, Zenhabits and a few others. Then after a while this self-talk started to grow like weeds in my mind. As time went by I found more and more weeds taking up the space in my head. Which put me in a real bad mood, to the point where I didnâ€™t feel like doing anything anymore – not even blogging. The important thing here is to catch this internal dialogue quickly. You never want to compare yourself to someone who is better than you (unless youâ€™re looking for ways to improve). If youâ€™re going to compare, then compare yourself to someone who is worse than you. You can always find someone who is down a notch from your current position. As you start to compare yourself to someone who is worse off, youâ€™ll start to realize how good things are. Youâ€™ll start to feel better about yourself and your position. Youâ€™ll start to feel more confident. And when you feel more confident, youâ€™ll start to take action. If youâ€™re going to compare, compare yourself against someone who is worse than you. At least that way you can bounce back quickly and get back to what you do best. Steve is a Mind Power Coach and the creator ofÂ Freedom EducationÂ - Mind Power for Your Personal Growth. Â He is also the author of the ebook,Â The Genius Within YOU. Â You can download his ebookÂ here. Post from: Blog Tips at ProBlogger. This entry was posted to Pro Blog Tips on Monday, August 31st, 2009 at 3:33 pm	and is filed under... General Interest. Both comments and pings are currently closed.